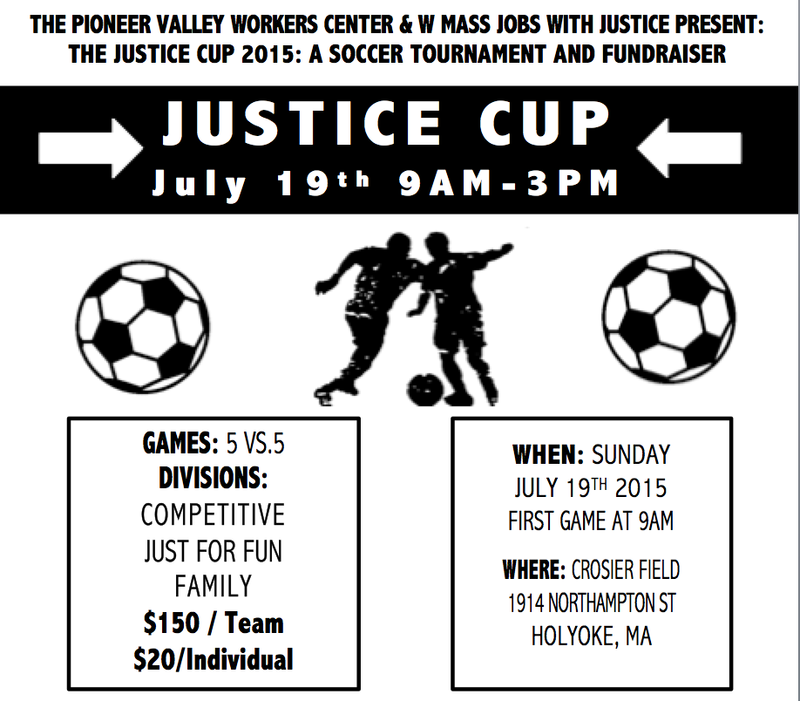 Registration is now open for the 2nd Annual Justice Cup! Sign up as a team, or as an individual and join a team, or just come to eat delicious food from Salsarengue and Beets and Barley and watch the tournament! There are a few organizations and individuals sponsoring teams so if the cost is too much just write back and we can cover the cost! LAST YEAR OVER 100 PEOPLE PARTICIPATED IN THE EVENT, WITH OVER 20 TEAMS. WEATHER YOU’RE A BEGINNER OR A PRO YOU CAN PLAY AGAINST TEAMS WHO ARE SIMILAR TO YOUR SKILL LEVEL. Don’t want to play? 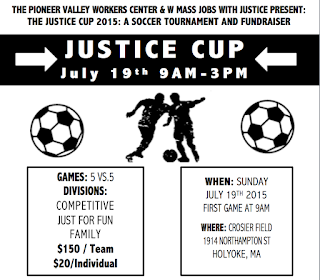 Bring family and friends for a day recreation to celebrate our love of soccer and Worker Justice! All proceeds go to Western Mass Jobs with Justice and the Pioneer Valley Workers Center. 1) Create a soccer team of 5-10 players or sign up as an individual and we will assign you to a team. 2) Pick a division: Competitive, Just for Fun, or Family. 3) If registering as a team, pick a team name and designate a Team Captain to stay in touch with the planning crew. You will be guaranteed 3-5 games depending on registration numbers. The games will be 5 vs 5 with small goals and no goalie. Each game will be 30 minutes long with two 15-minute halves. All players/teams are expected to bring a light and dark team jersey. There will be a strict no slide-tackling rule. Amateur referees will call the games.